The appeal challenges a judge's ruling that restored threatened species protections for more than 700 bears in and around Yellowstone National Park. Protections for the animals had been removed in 2017. When the ruling from U.S. District Judge Dana Christensen came down in October, Wyoming and Idaho were on the cusp of hosting their first public hunts for grizzly bears in the Lower 48 U.S. states since 1991. Federal biologists contend Yellowstone-area grizzlies have made a full recovery after a decades-long restoration effort. They want to turn over management of the animals to state wildlife agencies that say hunting is one way to better address rising numbers of bear attacks on livestock. But wildlife advocates and the Crow Indian Tribe successfully sued to stop the hunts. Their attorneys persuaded Christensen that despite the recovery of bears in Yellowstone, the species remains in peril elsewhere because of continued threats from climate change and habitat loss. The Yellowstone population has rebounded from just 136 animals when they were granted federal protections in 1975. Grizzlies in recent years have returned to many areas where they were absent for decades. That has meant more dangerous run-ins with people, such as a Wyoming hunting guide who was killed this fall in a grizzly attack. Christensen's ruling marked the second time the government has sought to lift protections for Yellowstone bears only to be reversed in court. The agency initially declared a successful recovery for the Yellowstone population in 2007. But a federal judge ordered protections to remain while wildlife officials studied whether the decline of a major food source—whitebark pine seeds—could threaten the bears' survival. The Fish and Wildlife Service concluded last year it had addressed that and all other threats. There was speculation the agency would not appeal the latest ruling and instead draft a new proposal to get the animal off the threatened list. 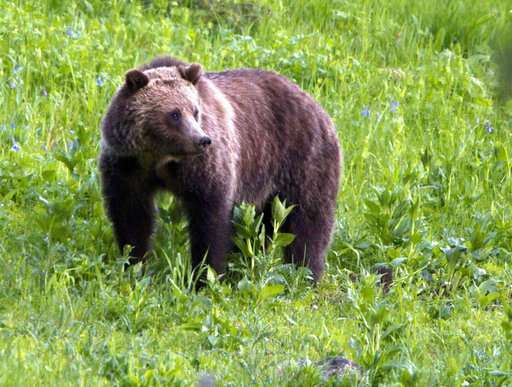 That possibility was raised by the agency's grizzly bear recovery coordinator during a meeting last month with Wyoming state lawmakers, according to the Powell Tribune. Friday's appeal signals that at least for now the court battle over grizzlies will grind on. But Andrea Santarsiere with the Center for Biological Diversity, one of the plaintiffs in the case before Christensen, said the government still has the option in coming months to dismiss the case. "I think Fish and Wildlife should go back to the drawing board and come up with a new plan to actually recover grizzly bears across the West, rather than a piecemeal approach," she said. Also pending before the 9th Circuit are appeals from parties that intervened on behalf of the Fish and Wildlife Service. They include the states of Idaho and Wyoming and groups representing hunting interests, gun rights and agriculture. Cody Wisniewski with the Mountain States Legal Foundation said that if allowed to stand, Christensen's ruling could make it harder for other species to be taken off the threatened and endangered species list. "Opinions like this move the goalposts," he said. U.S. Fish and Wildlife spokeswoman Jennifer Strickland referred questions about the case to the Department of Justice, which did not provide an on-the-record comment.